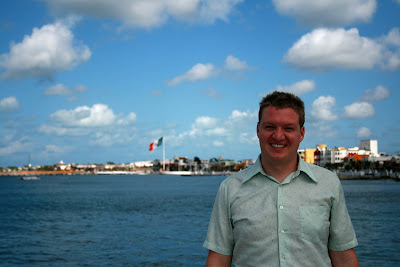 We went on our first cruise last week with our friends Mark and Lindsey. Even though the late night Chocolate Buffet was completely disgusting, we managed to have a really good time! 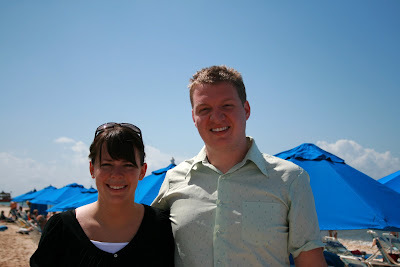 We weren't very good about taking pictures but here are a few snapshots of our week in the Western Caribbean. Here is where it all began. 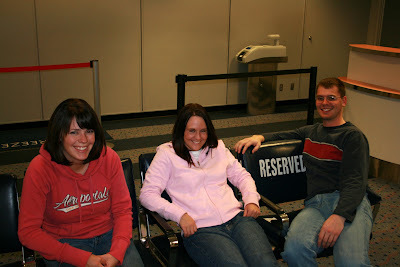 The red-eye flight was a bad idea. 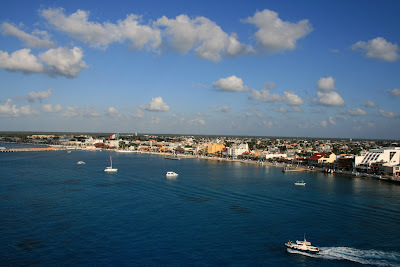 Our first stop was Cozumel, Mexico. Here is the view from our boat. Blake with the Mexican flag behind him. Me & Blake on some beach in Cozumel. Here is where I tasted the second best pina colada I've had. The first was on the boat. 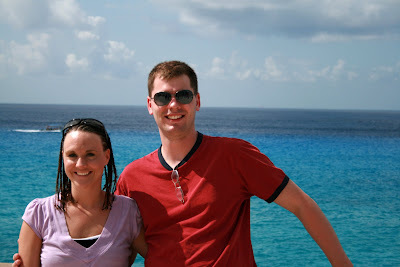 Lindsey & Mark in front of the bluest water I have ever seen. 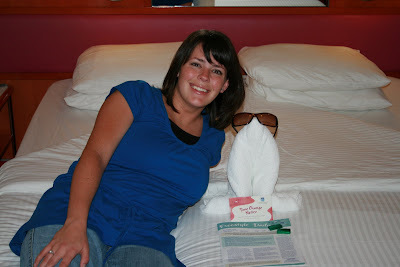 Me with one of the many towel creations that was waiting for us after a long day of eating. 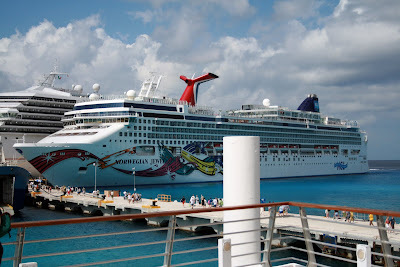 Our second stop was Grand Cayman. We decided to be a little adventurous at this port and took a boat several miles from shore to swim with stingrays and snorkel by some coral reefs. Here is Blake swimming with the stingrays. I chose to stay on the boat and watch at a safe distance. 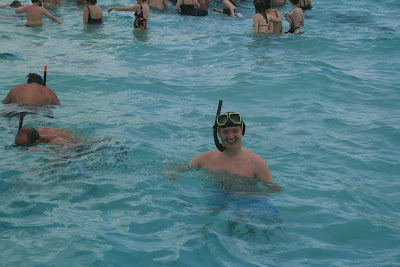 However, I did snorkel and found it to be quite enjoyable. Our residence for the week. When I first saw our boat in Florida I was quite concerned. I didn't think a boat that was painted like that could be a good sign of what was to come. I was pleasantly surprised once boarding it though. It was beautiful inside. Our rooms were MUCH bigger than I expected. 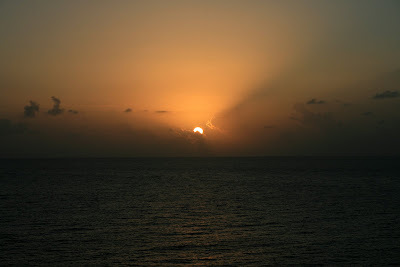 A picture of one of the sunsets from the boat. This is Mark resting on Seven Mile Beach in Grand Cayman. 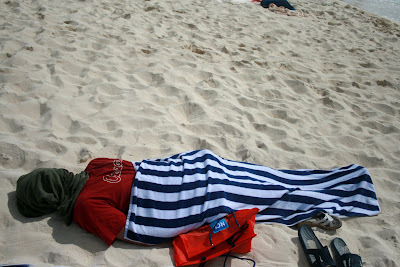 Can you tell he didn't want to get sunburned? 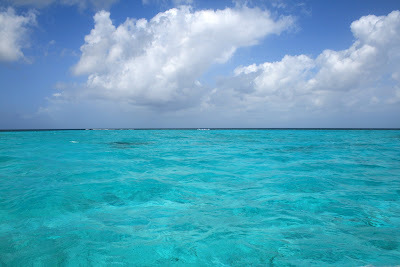 The waters of Grand Cayman. There was a photographer on the boat that would show up every night while we were eating dinner. 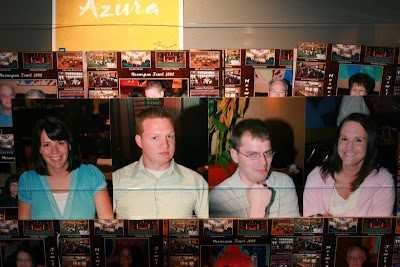 The funniest part was that he would take a picture of each couple and then he would take individual portraits. Blake and Mark made it interesting by striking ridiculous poses. 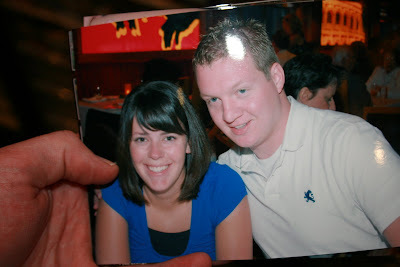 You could buy a 5x7 for $12.95 but to save a few bucks Blake was creative and took a picture of our pictures. This was another stolen photo of one of Blake's finer poses. How fun! I am quite jealous that you guys got to go on a cruise. I LOVED our cruise! You two are so cute. Sounds like fun! That water is so pretty. A cruise sounds so nice right now! By the way, how do you go wrong with a chocolate buffet? Looks like you had blast! I'm super jealous!!! I love that water and the best is that the picture doesn't do justice for what it was really like. Glad you guys had fun. Glad your back, and I'm sure the girls missed you too. Oh how fun! looks like an amazing vacation. You will have to give us some tips on cruise planning. That is where I wan't to be right now! It looks like you guys had so much fun. Jared and I went on a cruise for our honeymoon which was wonderful and fun but a little on the lonely side. We were all a lone and didn't really make an friends on the boat. I'm glad to see that you had some friend to go crusing with. Ok I am really jealous! So what did you do with your babies? That gives me hope that I can still do stuff like that even with a kid!